"Corporations can’t donate to politicians. But $100,000 got them VIP treatment during Gov. Greg Abbott’s inauguration." was first published by The Texas Tribune, a nonprofit, nonpartisan media organization that informs Texans — and engages with them — about public policy, politics, government and statewide issues. Corporations can’t donate to politicians. But $100,000 got them VIP treatment during Gov. Greg Abbott’s inauguration. By Shannon Najmabadi and Jay Root February 7, 2019 For $10, thousands of Texans could get a plate of barbecue on the Capitol lawn, just after the governor and lieutenant governor's oath of office ceremony. For another $125, a lucky few snagged tickets to see country legend George Strait play at the sold-out inaugural ball that evening. The price of access skyrocketed from there. According to the event’s official program and a fundraising solicitation obtained by The Texas Tribune, dozens of wealthy Texans and businesses pledged thousands of dollars — and in turn, received entrée to special events or time with the state’s top leaders. Gov. Greg Abbott’s office did not respond to questions about the event, including the cost to hire Strait. The chair of the nonprofit inaugural committee that organized the festivities, banker and Texas Transportation Commission Chair J. Bruce Bugg Jr., could not be reached for comment. Philanthropist Mindy Hildebrand and billionaire oilman Ray Hunt, the co-chairs of the committee, did not comment and deferred questions to Bugg. Donations to the inauguration are not deemed political contributions under state statute, and the inaugural committee, whose creation is mandated by law, is not required to make financial disclosures before this summer. But although corporations can’t make direct donations to political campaigns or elected officials, state law permits them to underwrite the inaugural events, two days of celebration rife with pageantry, pomp and — for the right price, VIP treatment. For context: The 2011 inaugural cost approximately $2 million. The 2015 inaugural committee raised $4.7 million, much of it from corporations. 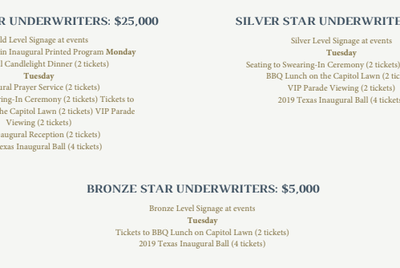 This year, those who gave $5,000 to the inaugural committee — “Bronze Star”-level donors — got two plates of barbecue, four George Strait tickets and promotional signage. 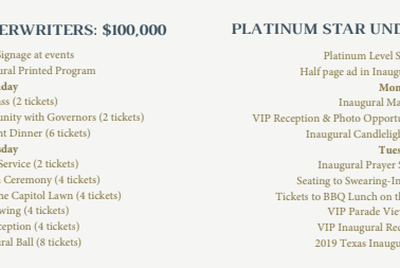 “Silver Star” donors — $10,000 — got all that plus seats to the swearing-in ceremony. The program for the 2019 inauguration included full-page ads for businesses that donated $100,000. Miguel Gutierrez Jr./The Texas Tribune In the upper-most echelon were “Diamond Star”-level donors who, for $100,000, were granted exclusive access to a candlelit dinner at the Fairmont Hotel in Austin, a prayer service, an inaugural mass, a photo op with the governor and a full-page advertisement in the event’s program. Sources familiar with the donation process said bundlers — fundraisers who help collect contributions without personally donating — were also named in the 72-page inaugural program. Those who paid at least $25,000 were invited to a well-stocked VIP reception at the inaugural ball that was cordoned off from the rest of the attendees, according to the solicitation and people present at the event. “It’s an indirect way for the lobbyists to schmooze,” said one attendee, who asked to remain anonymous because he was not authorized to comment publicly. “There definitely were two balls going on.” In the main hall, where lower-level donors gathered, “you just didn’t run into anyone important,” the attendee said. There were cash bars there and, according to multiple party guests, no food. The Tribune found the names of top underwriters and the amounts given in a glossy brochure and a fundraising pitch sent to prospective donors. Spread across 52 pages in the printed program, the names and corporate logos of the sponsors include several businesses with interests before the Legislature, from Big Oil to beer distributors to high-powered lobby firms. State associations dedicated to general contractors and to oil and gas interests were designated "Headliner Sponsors," as were billionaire oilman Jeff Hildebrand and his wife, Mindy, who helped coordinate the festivities. It was not clear what those sponsors donated to receive the label, which gave them top billing in the inaugural program. Diamond-level sponsors included AT&T; Corporation; H-E-B grocery; Midland oilman Javaid Anwar, an Abbott appointee on the Higher Education Coordinating Board; John Nau, a beer distributing magnate and Abbott’s campaign treasurer; and oil pipeline billionaire Kelcy Warren, whom Abbott appointed to the board of the Texas Parks and Wildlife Commission. One of the few public entities — perhaps the only public entity — named in the program was the Texas A&M; University System, listed as a Silver sponsor. A spokesman for the system said the contribution came from the Chancellor’s Century Council, a private group of boosters. Disclosure: The Fairmont Hotel, AT&T;, H-E-B, Javaid Anwar and John Nau have been financial supporters of The Texas Tribune, a nonprofit, nonpartisan news organization that is funded in part by donations from members, foundations and corporate sponsors. Financial supporters play no role in the Tribune's journalism. Find a complete list of them here. Read related Tribune coverage At inauguration, Gov. 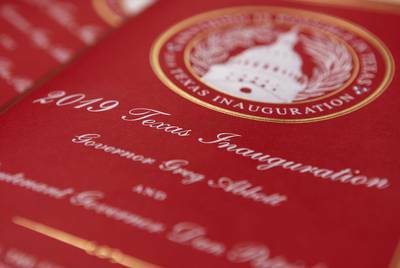 Greg Abbott promises "we are going to get this done" on school finance and property taxes Inauguration Donors Include Democrats and Gamblers TribCast: Texas inaugurations and big ideas for education "Corporations can’t donate to politicians. But $100,000 got them VIP treatment during Gov. Greg Abbott’s inauguration." was first published at by The Texas Tribune, a nonprofit, nonpartisan media organization that informs Texans — and engages with them — about public policy, politics, government and statewide issues. Link back to the original article, which is located at https://www.texastribune.org/2019/02/07/wealthy-texans-pay-for-access-to-top-texas-leaders/.